To speak after Jaroslaw Kaczynski is more demanding than chasing VAT carousels, which we are successfully doing. But here we are, at the sports arena, where we are hosting our Congress. We counted 960 players so far, the coach is with us, very demanding at that, next we need to ask what the score is. I can tell you that, after the first half of our term, the score is 4.0 GDP (Gross Domestic Product) all while the referees rather favor the other team. Someone stopped me in the hall and half-jokingly said “30 minute speech then 30 years of implementation” – well, they could not have paid our government a better compliment. We are one and a half years into executing our program; we scored huge accomplishments and considerable implementations. We have materialized anticipated social reforms/our pre-election promises: the 500 plus program and the retirement age decrease which comes into effect this October. Our other social projects include programs for farmers, for rural centers, for the elder population, e.g. 75 plus, insurance policy and other reforms promoting families and the general population, which we sometimes forget because we usually showcase the most important programs like 500 plus. We have done all this without raising taxes! Today we have a beautiful date, July 1st, the anniversary of the Lublin Union in 1569. This was when the Polish Crown and Lithuania created the Great Commonwealth, in pursuit of greatness and unity. Today, we are also promoting the desire for unity. Through our programs we embolden the entire population. This is our goal, to build the Polish Republic to be more cohesive, more compassionate, and more democratic. Our adversaries accuse us of promoting social solidarity policies over economic ones. So today I want to speak to you about economic topics. I was asked why stage this Congress right at the start of summer, when people are taking their vacations. My reply was: this Congress is being held here, now, so that individuals can go on vacation in even better shape, one or two years from now, so that even more Polish families are able to afford that vacation trip. This is our main goal. This is also why we are attacked for our policies, because we are a solidarity team, a government and a political party that pay attention to equal opportunities. That’s how we perceive the definition of democracy and democratization and we want to fulfill our program effectively. If I were to define our social and economic policy in one sentence, I would put it this way – we desire that every Polish family, every Polish adult man and woman could plan their life within a 30 – 40 mile radius of their birthplace or residence. This is our practical way of understanding the principle of social solidarity. If someone wants to be mobile let them be mobile, but for those who want to live and work in the vicinity of their hometown – we want to accommodate them everywhere, not only in Warsaw and large cities – but in small towns like Przysucha, where we are today, in places from Lebork to Rawa Mazowiecka, from Suwalki to Krosno or Luban, finishing in all Polish towns and villages. This is one of our chief goals. We are ferociously attacked, but we will not deviate from this course, because we stand responsible to our nation. Such is the program of the Law and Justice Party. In this context, I would like to thank you, our fellow citizens. During the past one and half years I have visited many municipalities, counties, and cities, and a plan for responsible development was born based on these hundreds of encounters. This plan hatched out of these meetings and is derived from the program of Law and Justice. We will faithfully implement this plan to provide social and economic development for all, without exception, citizens of our nation. When we think of the reduction of poverty among children from 11% to 0.5% – still that 0.5% is too much – this is how we perceive opportunity for our people. I don’t want to focus on the sins of the III Polish Republic – economic sins – but for the record something has to be said. A nation’s power is determined by its’ material and spiritual strength, and by its perspectives for socio-economic development. To a large degree we, today, are not starting from point zero – we began with a ball and chain attached to our legs, and we have to manage multiple problems inherited from our predecessors. It’s like riding a bike, changing one’s jacket, and tying a shoelace – all at the same time. We have to think about all the issues outlined by our chairman for the coming years, but at the same time we are behind in many areas, and in human terms it seems impossible to turn this around in just a few or even several years. What are these main sins? First of all we were dealing with deprivation of property. Instead of enfranchising our population, it was expropriated. It’s a paradox that in the 19th century foreign powers to a certain extent permitted private ownership in Poland – while in the 90’s, after the 1980’s when we owned substantial national wealth – illegal transfer of property became rampant. I recall the shock my colleagues in the banking sector experienced few years ago, when I sent them figures which showed that we annually transfer out 90+ billion Polish zlotys. This is the burden we are facing! Imagine, Ladies and Gentlemen, that figure; ninety some billion zlotys each year transferred out to other countries, legally, without taxation, as our chairman correctly pointed out, due to special inter-governmental agreements. This is the model of economic development which we began with, which was accepted by the previous government. Today, putting it bluntly, 5% of Poland’s GDP leaves our country. There is no point in speculating what would happen if it didn’t, but we need to remember this was our starting point. Secondly, a great mistake of the III Polish republic, not only from the economic model perspective, was the mistreatment of people from small towns and villages, the polarized diffusion model of development. Paraphrasing our great poet, Adam Mickiewicz, these small local homelands do not belong exclusively to poets, but are the homeland of entrepreneurs, skilled tradesmen, engineers, doctors, and farmers, who are building the value and greatness of our Homeland. What brought us all here today is our desire for Poland to be magnificent. We want to break through the weaknesses inherited from our predecessors. They also include the “loss of blood” by virtue of emigration. We must address these problems. Among the weaknesses we inherited lies a giant foreign debt. Before we came to power, economic growth was based, to a large degree, on foreign credit. Today more than half of our obligations, half of our private debt, is in foreign hands. Where does this 90 some billion come from – well it comes from that. Our GDP is around 2 trillion zl – but our dependency on foreign financing is 2 trillion 200 billion zl, which means our debt has risen more than our annual GDP amount. We painstakingly tackle this to turn it around. Our government has recognized the immense value of export, of competitiveness, and innovation of which I will speak later on in my presentation. We have already achieved things we can be proud of. After a year and a half we can see that the new economic model we implemented provides good results. Not only has the GDP growth been 4%, while just 6 months ago the rating agencies predicted it to be 2%. In particular I want to emphasize the social aspects. We have achieved lessening of the inequalities, for example the discrepancy in wages: just two years ago, the difference between the upper 25% of earners and the lower 25% amounted to 6 fold – today that difference is 4-fold. This kind of sharp decrease not only hasn’t happened in the 28 years here in Poland, but I don’t remember it to have been noted in any country and I have studied many of them; that anyone had managed to do that. This was the result of the 500+ program, and other such initiatives that even up the level of income. Thanks to this program, in one year the recipients attained on average a 7% increase of income at their disposal, in rural areas a 10% income increase, and families with 3 or more children 25% increase. This is an incredible feat. And it wouldn’t be possible without you, without your work in municipalities, counties, and electoral districts to explain our economic model and not let it be distracted by our opponents pretending to be wise-men. When I think of the III Polish Republic – oftentimes ugly epithets come to mind – but one thing is certain, the disadvantaged little guy was treated like a laughing stock. This picture returns, like an echo, when just recently, a prominent III Republic professor described people who voted for Law and Justice and other anti-systemic parties – as plebs, “plebeians arrogant and full of ignorance.” Earlier, another professor called our electorate, meaning half of the population, as a revolt of rascals against the elites. I don’t know if the word “elite” applies in this case, but such is the change we are implementing. Today we are rebuilding our intrinsic sovereign economic policy. What we had before was an economic model based purely on consumption imposed on us by foreign advisers and implemented by domestic so-called elites. This model caused the above described inequalities and foreign indebtedness. We will gradually fix them. After 28 years of independent Poland, our country has achieved adulthood, we received our “High School Diploma”. Just a remark: I remember my high school graduation during the martial law, when after being severely beaten and hospitalized, hospital doctors, friendly to the underground, devised a plan that an ambulance would take me to school to prevent arresting me on my way, so that I could complete my graduate exams. Today looking at our maturity we can say we have entered into a new phase; we have accomplished a solidarity-style Poland. I know, for I have counted quickly all the new postulates assigned to me by our chairman for the next couple of years – that’s a good few billion zlotys right there, but we can handle it. Today we need to realize that we have achieved something unbelievable, we are living in a solidarity-style country. I have the conviction that we are a country that cares for her people – unlike the previous 25, or 28 years. Today our policy is the well-being of families, children, patients, all those who require support, but also the regular guy and the average Polish family. This is the most important for our people, besides of course lofty wonderful values and ideals – may they inspire as many people as possible. Work, wages, family, and a place to live, and if you compare in each of these aspects what was going on two years ago and where we are now – we have made a giant leap forward! A leap, unexpected by our opponents and predecessors. It was Galileo who publicly denied Copernicus’ theory, but in private admitted “indeed it turns“ – and likewise our opposition, in public it holds demonstrations screaming that everything is collapsing, soon Poland will be in ruins and the budget will burst at the seams – but privately in quiet they admit “indeed it is possible to implement social programs and not suffer a budgetary deficit – indeed you can fight for your interest in Brussels – you can fight for the business sector – you can walk away from the indoctrination of shame – yes, you can build a strong Polish economy and stable public finances!” We hear similar things from our adversaries abroad, those who are not crazy about us. For example, just last week Bloomberg recognized our fight with the underground market and our noticeable progress in the tightening up of the tax system. The Financial Times, a holy grail, and a major prognostic for the Western elites, appreciates the positive development of our economic policies. Le Monde, too. The reason for this is, because on the international arena, we state our case clearly: we fight for the rights of our businesses in Brussels, we fight at the G20 meetings for tightening of the tax system, we fight to be able to implement instruments opposing VAT and other tax havens; and this constitutes entirely new policy of our country as opposed to our predecessors. We forcefully fight for our rights at the EU. When President Macron of France remarked that the European Union is not like a supermarket, I agreed with him 100%. And our desire would be that the French banks and French supermarkets did not enjoy, as they have until now, tax free operations in Poland. While it is true that on parking lots, in the suburbs of Paris or Amsterdam, there are a lot of Polish truck drivers, in Polish cities, like Krakow, Koszalin or Suwalki there are plenty French supermarkets, Dutch banks, or German owned media. We would gladly trade places, but I’m not so sure they would want to. Within the international forum we are fighting with gravely erroneous policy towards tax havens. Tax havens are hell for societies; the way to tax havens is paved with un-built roadways in other countries, under-invested hospitals, and scrapped police stations. That’s why our predecessors eliminated police stations in such large numbers, failed to invest in hospitals, and did not build key elements of our infrastructure, because they did not supervise the operations of our tax system, our tax base. We are working on all these issues at the OECD (Organization of Economic Cooperation and Development), at G20, at the European Union, and today there is clear proof of results. I just finished studying figures on the income for the 1st half year, and I can tell you right now – the revenue we managed to generate from tightening up of our tax system is more than our net income from the European Union, for all of last year. These are numbers for half of the year only. The III Polish Republic was a time of dividing our country into those who come from big cities and those from villages and small towns – like our poet Slowacki exclaimed in his literary work Kordian “they tore her into pieces, this garment they tore into pieces“. We want to sew these pieces back together so that everyone – regardless where they come from – enjoys equal opportunity. This is the basic axiom, the basic value of our economic and social policies. how to take advantage of them. We need savings, investments, innovations, export, and infrastructure. We will base our economic growth on these elements. Countries that based their economic growth on these elements are beyond comparison today, they were able to protect and grow their economies. We are not following any ideological extremes, like neo liberalism or socialism. We look at economics through the prism of connectivity. We strive to connect local economy with an opening towards Europe, but also to connect the economy as a whole with society. This has been a new approach of only recent years, that one can connect economy with society, with the community, and it works. For neoliberal economists, frequently these were two separate entities. But they are not separate entities, they are banded together, and one attests of the other. Without the wellbeing of the population there is no effective, healthy economy. We want to connect local and big town businesses. The small town Poland has yielded excellent Polish companies. Our economic program is mainly addressed to them. Here are a few examples of such companies: Inglot, Pesa, Oknoplast, or Vista from Gdynia – which today is the Chief Contractor of a major bridge construction project located beyond the Arctic Circle. Earlier Polish companies could only be subcontractors. Many had to file for bankruptcy as was the case in highways construction program scams of the past decade. These Polish firms deserve to surf and ride and grow atop our new great wave of investments, and we intend to deliver this opportunity to them. We are proud of these companies yet for another reason – because they are buying out their competition in the West. Companies like Nowy Styl that is buying furniture manufacturers in Germany, or semi-trailer maker Wielton Corporation that bought companies in France, in Italy and Germany. They make us proud. I see in the audience Mr. Jasinski, President of Orlen. Ladies and Gentlemen, did you know that the Orlen Corporation’s subsidiary in Germany is the largest company in the Schleswig-Holstein, one of the 16 German Land provinces? Our economic program is addressed to them – to entrepreneurs, to managers, to businessmen, to engineers. I wanted to tell them: we are a political camp that is working on your behalf; we have a government that wants to build up Polish capital, Polish ownership. We fight for our interests in Brussels because it is in our best interest. The fight for equal opportunity and competition is in our interest. The battle for VAT collection and equal competition from the point of view of tax policy is in our interest. It is also a battle for decent wages which well qualified workers deserve; indeed a battle for efficient state, honest taxes, good government, which are in our common interest. As I look around Poland, many companies are popping up and growing all over – also in smaller towns like Jawor, Sroda Slaska, Suwalki, and Augustow. Plenty of investments have just recently surfaced in the Swietokrzyskie Province which used to be teased, as a kind of no man’s land, midway between Krakow and Warsaw. Today their unemployment has fallen below 10%. The same is in Lomza, where permanent high unemployment was historically a big problem. This is a special reason for our pride, the lowest unemployment rate right now in Poland. President Lech Kaczynski once said that for a dogmatic economy Professor to say that unemployment is 16% is like saying that a streetcar number 16 is going from one place to another. We beg to differ, for us, 16% unemployment rate means hundreds of thousands people out of work, in a dramatic financial situation. That is why, what we are doing in that field, from my vantage point, is most crucial. If I were compelled to reveal just one magic number I would highlight our diving unemployment rate as the apex of what we were able to achieve. When we talk about building of a modern Poland, what do we need above all? We need more savings that would turn into investments. This is somewhat new to us, not well understood, but I checked our Law and Justice Party program and it articulates from day one decreased spending for public administration which will lead us towards savings. We want our government to be efficient and frugal. We need to remember that we had those types of economic policies, against which we forcefully protested and campaigned for years, it was the “consumption and limited opportunity” model, but today we have a chance to drive a new economic policy which is based on different values. We are building republican capitalism, a policy of equal opportunity and solidarity. And that’s why we must search for and find more resources if Poland is to become more innovative and break out of the middle income trap. We must overcome myths that capital has no nationality, that greed is good, that inequality is good. Many of these myths we overcame already. We need to think about great projects that will steer our economy into the right direction. Now I would like to speak about some of these projects. The first one is the tightening up of the tax system. Even our most noble plans would have been too difficult or even impossible to realize – if we did not already reach a spectacular success in this area. Our opponents did not believe us, when we assumed power; they sat down with their calculators and announced that our budget will break. They were measuring us with their own standards. The VAT mafia laughed in our face, but that’s how it is – first they ignore you, then they mock you, then they fight you, and in the end you win – and we are winning today. Albeit a fresh victory, but we have started winning with this VAT mafia and have achieved numerous victories. This is the largest project of all other big projects. To look at it from a different angle, we can ask how it happened that when the Czechs and Slovakia implemented reverse VAT, and everyone moved their operations to Poland, the authorities here missed it for three years. How was it possible that Poland was a corridor for illegal gas and oil smuggling? How did it happen that Poland became the largest producer of diesel fuel, and no one reacted? How was it possible that Poland suddenly became a huge cell phone manufacturer, and no one noticed? One example is the export growth by 1000% one month to another. Those of you in the audience who are entrepreneurs, but also anyone who can count, know that if you discover a 100% monthly increase or fall – it may be cause for joy or worry, depending on what it is, but it sure warrants a closer look and ordering an audit. Meanwhile, nothing happened for over a year. Later when finally a new Bill was passed, another 6 months went by due to vacatio legis – this meant additional billions of zlotys in losses just by this token alone. In total: one billion zl Polish export times 18 months, times 23%, meant a 4.5 billion zl loss to our budget. There is one figure which pins all of my question marks into one. It is 220 billion zl, during our predecessor’s time in power, this is what the Polish budget lost as estimated by independent institutions, not necessarily our fans, among them the European Commission, and various consulting firms. Ladies and gentlemen, this number is greater than all the money circulating in Poland. If we spent these 220 billion zl on construction of freeways, we would get the highest number of express roads per sq mile in Europe. We could have not a 500+ program but 5,000+ program for a year, 10 times more. It is such a big number. Thanks to our analytical, mathematical and statistical mechanisms, but also by virtue of monitoring – there are 25 thousand cistern inspections monthly (tens of thousands more than during our rivals in power) – we are achieving results. Our vision of Poland embodies belief that the Polish state constitutes a great value – this distinguishes us from our predecessors who mistreated the Polish state as if it were a night janitor. For us the Polish state is sacred and a great value. If we told the Scandinavians, French, Koreans, or Germans that their state ought to be a “night janitor” first they would laugh at the idea, then they would be astonished. Nevertheless it was the prevailing thinking in our country. Our international partners use their sense of statehood to empower their companies abroad, to strengthen the efficiency of their tax systems and their socio-economic systems. That is why they attain great success, while we have to make up for all the years we lost. When we think about huge projects, we think about infrastructure. First, a side remark: who was the first recipient worldwide of the Liedental medal – I see a few gliders in our audience – the highest medal for glider pilots? Of course it was a Pole – glider Tadeusz Gora for his 570 km flight from Bezmiechowa Gorna to Soleczniki in 1938. According to our predecessors, our main airport, the central transportation port of Poland, was supposed to be in Frankfurt on the Main, or Munich, or later in Berlin. We reject this idea. We will build the Central Transportation Port – the key infrastructural project, the beating heart of Polish communication, comparable with the port of Gdynia for the II Polish Republic. It will be completed faster than many opponents of this investment expect. We will break this impossibility which ruled Poland for far too long. We are weighing the idea, also, to build high speed trains. Poland is kind of in the shape of an oval, and it is not a vast country. High speed trains would greatly help in communication between our large agglomerations. A Polish team is competing and made it to the semifinals of the Hyperloop Project – the construction of high speed low-pressure tube trains; maybe for some of you this is science-fiction, but iron cast train cars also were science-fiction in the 18th century. Maybe one day low-pressure tube trains will be travelling on the tracks we will make for high speed trains . We want to support innovation. I wanted to announce today that we will provide financing for construction of new bridges. Poland is divided by our beautiful rivers, Vistula, Bug, Narew, Warta, Odra. We need at least 8 to 10 bridges to connect regions located on these rivers. For example a bridge between Kazimierz Dolny and Janowiec will connect these beautiful cities. Another one, between Gora Kalwaria and Deblin, where there is a stretch of almost 50 miles without a bridge across the Vistula. We need many such investments. It will energize these regions and bring investments. Infrastructure also means road construction, and I wanted to mention one: Via Carpathia – the backbone of Eastern Poland. I can promise that we will start its construction – it will run from Bialystok to Siemiatycze, Radzyn thru Lublin, further South to Krasnik, Stalowa Wola, Rzeszow through Dukla Pass into Slovakia and Hungary, Romania, Bulgaria to Greece. It will be the new amber trail, and we will have increased opportunity for all Polish businesses and people who live and work in the region of Eastern Poland. We need more bicycle trails. Bicycle tourist industry is important to local economies. It increases employment in agro-tourism, hotel and restaurant industries, and provides opportunity for small size Polish businesses to grow. We are planning to construct 5,000 new bicycle trails. They will connect Piast castles, or for the Centennial of regaining Poland’s Independence, the footprint of the First Cadre Company, or go from Vistula Spring to the Baltic. It will be good for people’s health, for local economies but also for beautification of the Polish countryside. Among the infrastructure investments we pay special attention to, there is one, Digital Poland, which is very important to us. Today Freeways A1, A2, and A4 are as important as soon the highways of megabytes, gigabytes, and terabytes will be. We are obliged to connect every Polish municipality, and we will do it for the Centennial of regaining of Polish Independence. It will be a program of 100 MB for 100 years of regained Polish independence. The young people, all who are using Internet, know that today this is fundamentally important. I read studies that show that people are most irritated by freeway traffic and slow Internet. Regarding freeway traffic we work with a traffic management company that promises that special solutions will be implemented if the traffic delays exceed 20 or 30 minutes. We also wanted to promise the Polish people free required-reading school books as electronic and audio books. This program will start September 1. We are following the dreams of Andrzej Frycz Modrzewski who was the first person in Poland to advocate public school system for children. We want to ensure good education for our children. Digital Poland and free books will help them to be successful around the globe. I wanted to mention our other programs for the youth. We have the minimum wage program, we have the lowest unemployment, for those with entrepreneurial skills we work to improve the regulations of starting their own economic activities. We have the „Business constitution”, we are simplifying administrative procedures, which is the biggest reform of economic laws after 1989. This is for both, our young citizens, and for entrepreneurs. I need to say that all of these changes and big projects we are planning in the infrastructure and in digital economy are possible due to the Polish Development Fund. This institution leads the effort of re-Polonisation of banks, and now we have 52% of Polish capital in our banking industry, while a short time ago it was only 25%. Thanks to the Polish Development Fund we invest in the Polish shipyard industry and in public transportation. This is done with no public money involved; only market funds are used. As I said we are rebuilding the shipyard industry, the last passenger ferry was built in Szczecin shipyard in 1979, and now two weeks ago we began building a new Polish ferry in the Polish shipyard for the Polish cruise line. We need one more thing to be successful in our big plans. We need all people, especially these sitting here in this hall, to work as one team. We cannot overemphasize the value of teamwork. It is extremely important. But we are optimists; we have every right to be optimists as Poles. For the first time in 28 years there are more optimists than pessimists in Poland. 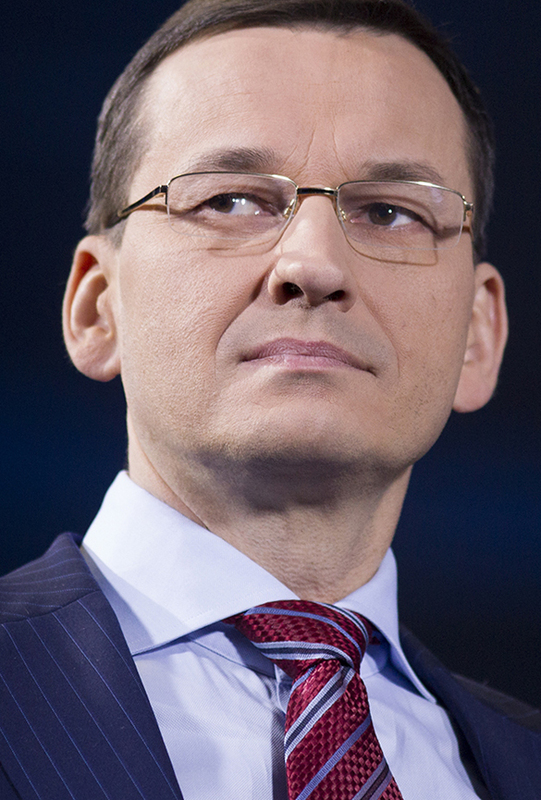 Poles for the first time saw a political party that delivers on its election promises. We now have achieved the highest level in 250 years of GDP per capita in comparison to the benchmark, USA. We Poles prefer to be owners. The owners of homes, the apartments we live in, some piece of land. During a recent conference my interlocutor asked me if we really need The Central Communication Port since there is one we can use in Frankfurt, and another one is being built in Berlin. I wanted to continue this line of questions and ask do we need Polish Airlines LOT since there is Lufthansa and Air France, do we need Warsaw Stock Exchange since there is the London one, do we need Polish banks since there are foreign banks, do we need Polish currency zloty since there is euro, do we need Law and Justice Party since there is German CDU (joke), do we need these things. The answer is really simple, we want them because we want our economic growth to be based on our ideas. We want to be proud of Polish entrepreneurs, inventors, scientists, artists, and musicians. The national culture is very important especially to support creativity and innovations. One who is not enthusiastic will not instill passion in others. We have this feeling, here in this room, and in our election districts. We have the will to reform our country, Rzeczpospolita Polska. We do it for all Poles, also those far from our political camp. The new modern Poland will be for all of our citizens. Poland will treat everybody like a Mother, but that’s how we also need to treat her. Poland cannot be divided, people must feel equal opportunities, and this is how they will mobilize to participate in our great projects and investments. Dear friends, our spiritual and religious strength helped us in the past to overcome many obstacles, many terrible moments. Today, over the last year and a half we designed a new roadmap for a compassionate Poland, but we still ask ourselves, what are the goals ahead? Are we to chase the rich Western countries in accumulation of wealth? Is this the race in front of us? Maybe this is not the right race, we could be in it for 100 years, so maybe this is not the most important race? Maybe we ought to be thinking about not just material things, but how to better ourselves in the spiritual sense? Our great writer Wyspianski wrote „we ought to want to want”, to be more compassionate towards each other. Our distinguished poet Gajcy wrote: „like two hands our memories and feelings are connected in one common home that grows above us”. Yes, we have one common home that grows in us and because of us. Dear friends, we believe in Poland. There is but one Poland. Thank you very much.